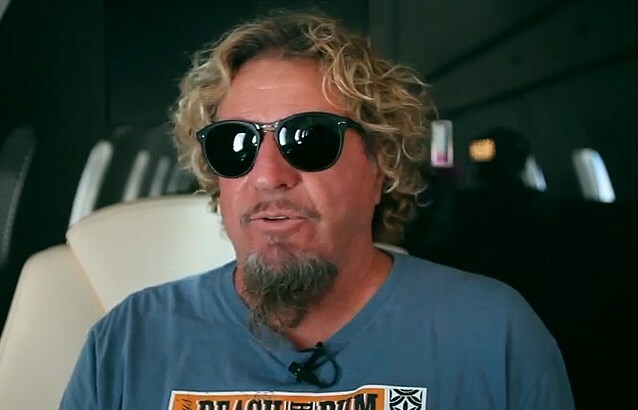 In a new video, Sammy Hagar is sharing the inspiration behind his forthcoming solo album, “Sammy Hagar & Friends”, due September 24. The project marks the Red Rocker’s first solo release in five years and sees him team up with a variety of artists, including Kid Rock, Nancy Wilson (Heart), Ronnie Dunn (Brooks & Dunn), Neal Schon (Journey, HSAS), Chickenfoot pals Chad Smith, Michael Anthony and Joe Satriani; Montrose bandmates Bill Church and Denny Carmassi, his solo band The Wabos and more. The record will be available in a standard edition package, as well as deluxe edition packaged in a high-gloss digipak. The deluxe CD/DVD package includes an exclusive bonus audio track, "Space Station #5", recorded live at the Ronnie Montrose Tribute Concert held on April 29, 2012 in San Francisco, as well as the "making-of" album documentary which includes bonus video of "Knockdown Dragout", and more. Hagar is currently on the road playing dates across North America.